The fellow that said “you can take a boy out of the country, but you can’t take the country out of the boy,” could have said that about girls also, and Esther Trupp of 4032 NE Mallory is proof. Esther was born in the Big Bend Country of Washington, two miles from the little town of Moody. And the farm training she was raised up with is still being used and is as profitable today as it was when she was a girl. Her family raised most of what they ate and she still does the same. The back yard at her home is a gardener’s paradise. She raises almost everything that grows and is in season. She was a bit late in getting things planted this year and did most of it in July, which is usually a bit late for this part of the country. But if you could see the crop she has, you would know there is more behind it than a green thumb. Just to mention a few, you will find beans, beets, peppers, tomatoes, potatoes, several kinds of squash, horseradish, a very prolific fig tree, a crab apple tree and other things too numerous to mention. A lot of people think they have to buy a lot of things to have a garden. A lot of people spend a lot of money to have a garden and don’t get back half of what they spent. Fertilizer is one of the major items, but Miss Trupp has that situation well in hand. She mows the lawn and parkway and saves the clipping, puts them in a pile until they dry and then she turns them under where she expects to plant, and if you could see the results, you will see she has the right idea. It pays off and she is reaping a good harvest. 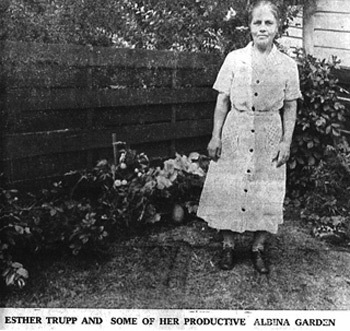 Miss Trupp has two sisters, Marie Krieger of 7533 North Chatham and Helen Abel of Seattle; three brothers, Jacob of Baker, Daniel at Eugene and Henry of Chehalis, Wash.
Miss Trupp thinks it would be a good idea to organize several youth garden clubs, teach them the principles of growing a garden and then have a number of them enter the county and state fairs, and possibly have a local contest and market for them to show locally and also sell enough to make it more interesting.